Hi All! Wendy here to share up another project that was on display in the CHA booth. I previously shared up a fun fun layout here a few weeks ago using the new Fabulous collection and now time for a mini book. You know I love to create up a mini "every now & then". So, I'm gonna hop straight to it because there are lots of pics to share to see it all and some random close-ups to show your more of the details. This mini was inspired to all the girls out there and just to be you.be fabulous.be groovy. Whew...yep, lotsa' pics but I hoped you enjoyed. Love these pics of my cutie cute cousins! They were angelic "sometimes" (key word - wink wink) but silly all.the.time. & sassy & fabulous too. Anyhoo, word is out on the scrap streets that "Fabulous" is doing well and hope you create something FABULOUS! (Ok, that was cheesy)...but you get my drift. Ha! Happy Monday everyone! Kim here with another set of quick & easy cards for you, this time with the DOCUMENTED line! My first example for you uses the Documented Collection in a traditional sense, as a wedding invitation. I started out with one of the new memorabilia pockets from the Odds & Ends Collection. I trimmed off the edge of the pocket so that I could more easily see the front of the invitation while it was in place. I then created an invitation that would easily slide in and out of the pocket. In fact, you could add a photo, an RSVP card, or even directions to the reception all in the same pocket! These would be adorable to make, especially for a smaller wedding! This line is so gorgeous and all the elements work together perfectly! The 6 x 6 Paper Pad with all of the reduced size prints and element cards make it simple to make great cards! Hello Simple Stories Friends! Emily here, reminding you that today's the last day to get your application in for the Design Team call. In case you are on the fence about applying, I highly recommend you do so, this has been such a great team! I know all the current DT members love it here. Today I have a card for you that I made using both the Fabulous line and Documented line. I love that Documented is so neutral and can go with anything you want to add to it. I think it makes the colors of Fabulous shine so well! It was easy to pull the sentiment from the 4x4 Quote and 6x8 Photo Mat Elements (#2313) and add it to a premade card blank with some minor embellishements. Here's a quick rundown of how I put it together. 2. Cut a 6.5" x 5" rectangle from Ever After (#2305), adhere to the front of your card blank. 3. Cut a 5.25" x 4" rectangle of Sweet (#2106), adhere to card as shown. 4. Hand cut a doily from the other side of Sweet (#2106). 5. Stamp two quatrafoils on Sassy (#2107) (I used the new stamp from Cocoa Daisy, which will be available on March 1st), cut out and attach a pearl to the middle of each. 6. Cut a muslin strip and mist with Cream Maya Mist. 7. Attach all pieces as shown and you are done. Once I decided on the design, this was super easy to put together. Now I have a card of encouragement when a friend needs a little reminder that all will be well in the end. Ali and Stacy Love Our New 6x8 Album! Our Simple Stories albums and accessories were the talk of CHA Winter 2012 - We're honored to have been chosen by BOTH Ali Edwards and Stacy Julian as their top products for 2012! They loved our new 6x8 album and accessories! Albums, divided page protectors, memorabilia pockets and journal/scrapbook album pages will be shipping late March 2012 to your favorite local scrapbook store or online retailer! 2012 Design Team Call - Due February 24! Are you the next member of our 2012 Design Team? 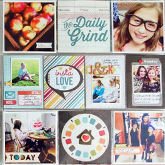 Do you love to scrapbook? Are you excited about new products, new releases and a whole new way to document your memories? Are you passionate about Simple Stories products and love inspiring others to share their story? Are you enthusiastic, creative, positive, friendly and love working on a team? Whether you're an undiscovered talent wanting to show off your creativity to the scrapbook world or an experienced fan favorite with your own unique style - Simple Stories wants to hear from you! If you are interested in joining us for an exciting, fast paced and rewarding year of scrapbooking, designing and inspiration please download the design team application below. We’re looking forward to hearing from you! We have already received hundreds of amazing and inspiring applications - but it's NOT TOO LATE for you to submit - you still have until this Friday, February 24 to submit your application! Please download the following application with all of the important details - again the deadline for design team submissions is February 24, 2012 and we'll announce the new design team members March 2, 2012! How about a simple sketch today? This one is all about the Simple Stories Flashcards and how you can layer them to make an interesting design in lieu of patterned paper. Hope this will inspire you to use up more aspects of your Simple Stories collections. This page was created with the Simple Stories Awesome Collection with just a bit of Year.o.graphy Basics. You can see how I used the 3 x 4 flashcards to layer underneath my photos and then added the license plate border from the Awesome 12 x 12 Fundamental Cardstock stickers. Pop dots make the stickers jump off the page a bit. How fun are these striped sticker letters from the Awesome 12 x 12 Expressions Cardstock Stickers??? I like the effect from the lighter colored stripes, which is a fun twist to the brown letters. Also added a few of the journal strips from the same sticker sheet with pop dots. Just a bit of bling to polish the stars and provide a little dimension. The ledger paper is from the Year.o.graphy collection, but everything else if from Awesome. Tip of the Day: Lay out the Flashcards and rearrange them to make a fun design before adding to a page. Try to vary the colors and designs. Add journal strips from the 12 x 12 Expressions Cardstock stickers for an extra sentiment or two. Awesome Materials included on this project. Hello peeps! Wendy here & happy to be back in action to post after the CHA spin on designing projects for the booth. I hear there was major major love for the new Simple Stories CHA releases! But I'm quite lovin' Fabulous too! So, sharing up one of my projects, a 12x12 layout, titled "Doodle Girl", that was in the Simple Stories booth using the Fabulous collection! I instantly thought of back a few years ago my sweet cousin, Mocha, LOVED to doodle and draw with pencil and paper. So, this was the inspiration behind the theme to really bring out that memory as well as my mom playing along with her. Additional inspiration behind this layout was basically my lovelovelove for stamps. The ledger paper/file folder border in "Fabulous" was just begging for some attention, so I cut it out of the paper in the collection, and added it as a side border to the Year.o.graphy paper (Newsprint #1917) + some machine stitching then proceeded to add in the doodle of stamps on the "file folder" flap. Just a random "mish mash modge podge" of stampy goodness. I picked out stamps that were deemed doodle worthy looking and put them to work here. This is definitely a way to blow the dust off your stamps and give them a workout. Every single image you see on this flap is a stamp! Fun, eh? Hope you enjoyed my inspiration project share! Mist - Studio Calico - Mister Huey - Pickle, Calico White, Ink - Ranger - Archival Ink - Jet Black, Wood Bingo Numbers - Advantus - Tim Holtz, Clear Fragments - Advantus, Thickers - American Crafts, Stamps - Cavallini & Co, Recollections, Bam Pop, MyStampBOX, Hampton Art, American Crafts - Amy Tangerine, Technique Tuesday, Imaginisce, KI Memories, Printworks, Fontwers, Prima, Jenni Bowlin, Stampers Anonymous, Claudine Hellmuth. Happy Wednesday to you! Kim here, sharing more of our booth designs from the lastest Simple Stories releases. Today, I have my creations from the AWESOME Collection! I love the name of this one....perfect for this amazingly AWESOME line of papers for the special guys in our lives! I picked up this frame at the local second hand store - perfect for the door of my youngest son's room! And of course, a couple layouts --- I couldn't ask for a paper line more versatile than AWESOME is! It literally coordinated with any of the photos I wanted to scrap of my boys! Whether it's for your husband, your father, or your sons, this AWESOME Simple Stories Collection is perfect for you! Look for it to arrive in you local scrapbook stores soon! I hope you have a AWESOME day! Hi Simple Stories friends! Emily here, sharing my two layouts I did for CHA with the Awesome line. I thoroughly enjoyed playing with these papers, the colors were scrumptious, the phrases were perfect for my teenage son, the motifs were not too themey for my theme-o-phobic self, and the different patterns made it so much fun to mix and match! This layout was inspired by this found on Pinterest. The only problem? I didn't have a good place for the journaling, so I added some very vintage Making Memories hinges (wouldn't it be great if Simple Stories made some?) I've been hoarding in my stash to the top of the photo and journaled on a 4x6 card. Now all you have to do is lift the photo to read the journaling. I love how perfectly the card fit under the photo, kind of like it was made for such a thing (wink, wink). For this one, I used a small dinner plate as my template and made a few large circles. I was inspired by this in my design. Again, I ran into the issue on not having a good place to put my journaling. I took a 2x3 flashcard and added a tab of paper plus a strip of ribbon and slid it in behind the photo. Now it looks like a decorative element, but I have a place to write about my son's last year of middle school. Because both of these layouts were design driven, I ran into the problem of not having a good place to journal. Don't let that stop you from getting your thoughts down on your layouts. I hope these two ideas will help you add more journaling to you pages. It's important to tell your story! Hello all! Although the "holiday season" is behind us, I am still in the mood for card making. Both my children have birthdays within the next 30 days, and that means that my daughter will be a) expecting a handmade card and b) rummaging through my stash to look for thank you cards. So, I love having a set ready and waiting around this time of year. Then pick one of the 6x8 designs with a "frame." Cut it out and simply fold it in half vertically. This gives you the most perfectly designed card base. You end up with a 4x6" sized greeting card - one of my favorite sized cards because I can easily slip a photo inside of the card as an added surprise. Once you've chosen a card base, you can do just about anything. I love stamping outline images on patterned paper. So, that's what I did for this sweet thank you card. A couple buttons, a little vintage twine and a sticker and my card is ready and waiting for the kid to snag and send. And here's what I did with some of the fun elements from the Awesome line. First I splattered the base with a little mist. Then I cut a piece of chevron from the patterned paper design, added some jute, layered some stickers and finished it off with a fun brad. I love that Simple Stories' products are so versatile! So, as you consider the next card occasion on your list, think about reaching for your Simple Stories papers and make it easy on yourself!